This was one of the first areas of work developed at Ryedale Special Families and still remains an important element. This includes basic factual information such as where to get a piece of specialist equipment, or which benefits apply, to more complex issues such as the process of getting a diagnosis for your child. We don’t know all the answers but we invariably know a family who has been there before you. We have an extensive library of information at Town Street to help you. The best advice comes from other parents who have experienced what you are going through. This can be done on a one to one basis at a family activity or at our fortnightly meetings of the Family Support Group. This group is run by parents and organises speakers to the sessions held at Town Street, as well as social events and family fun days during the holidays. Many statutory agencies want an informal view of what parents think about an issue and they can come and sound out the Family Support Group. The group also help with many of our fundraising activities at which volunteers are always welcome. Parents have to attend a myriad of meetings with professionals working with their child. Some of these can be daunting as it is difficult to take in everything being said. If you would like someone to support you at these meetings then we can normally help. The most frequent meetings we attend are the Team Around the Child meetings that follow a Common Assessment Framework (CAF). We also frequently attend Child In Need meetings, Statement Reviews, Child Safeguarding meetings, Tribunals and Appeals. At Ryedale Special Families we hear many stories of what goes well and what goes less well for families. It is important that professionals who make the decisions in relation to health, education and social care are aware of these. We have therefore developed links with these services and can pass on these messages so that the policies and procedures can by modified accordingly. RSF was also involved in the establishment of NYPACT, the Parent Participation Forum which has taken on this role in recent years. RSF has been influential on many issues over the last 17 years from the role of local special schools, to improving the waiting time for the diagnosis of autism. 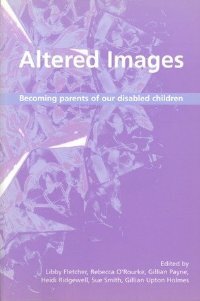 “Altered Images - Becoming parents of our disabled children” is a must-have read for parents of disabled children. A group of parents from Ryedale Special Families joined together to share their experiences and realised they had the authority to write a book about facing the challenge of who their children were. Each parent has confronted different situations - Autism, Cerebral Palsy, Down’s Syndrome, learning disabilities and having babies in special care units. What they had in common was a world that didn’t understand and that world sometimes included families and partners. The result "Altered Images - Becoming parents of our disabled children" is written for other parents, to guide and sustain them on the complex journey ahead. The book explores diagnosis, dealing with the professionals, decisions about schooling, independent living and family life. What sets this book apart is its truthful and unsentimental account of a life very different from that which any parent expects. The book does not provide easy answers nor does it have a feel - good happy ending. Altered Images tells it as it is ...the highs, the lows, the good and the bad. It is a book for anyone who needs a better understanding, especially professionals working with these families. They will gain an unparalleled insight into the daily lives, struggles and pleasures of ordinary people with extraordinary children. Available directly from Ryedale Special Families, price £5.00 plus £2.50 p&p.